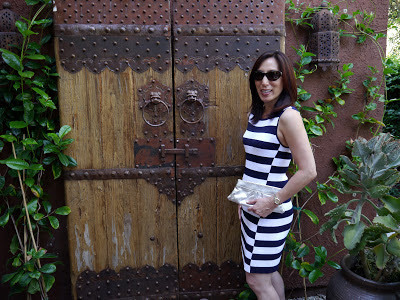 Even though stripes have been pretty popular for the past few seasons, I didn’t own a striped dress. Generally, I’m not a huge fan of horizontal stripes because they add width. What attracted me about this dress, though, is the offset front panel-I thought it was a unique touch that broke up the horizontal line. Since buying this dress, I’ve seen a few others that are similar. Another great thing about this dress is its versatility. It can be worn to work with a blazer and pumps, to a party or nice dinner with heels and a clutch and as a daytime dress with sandals and a cardigan.